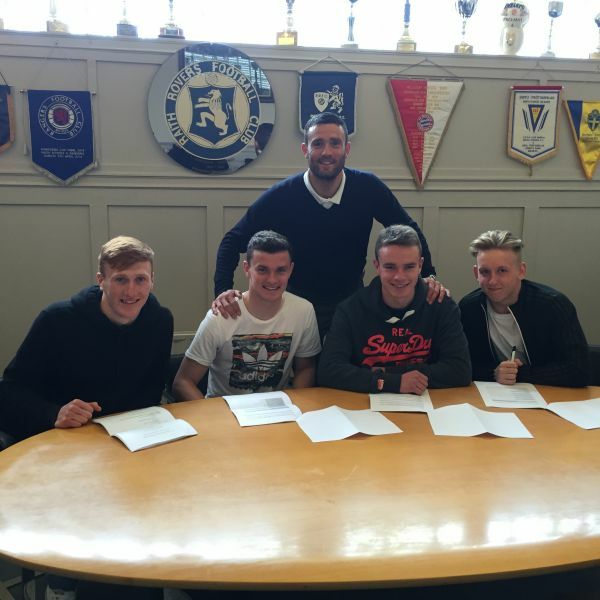 Raith Rovers FC is delighted to announce that 4 young lads have successfully completed their apprenticeships and have been rewarded with their first professional contracts with the club, showing our commitment to youth going forward. 19 year old midfielder Ross Matthews, who made an impressive 1st team debut at Dumbarton in the last game of the season, has signed a 2 year deal. Meanwhile centre half David Bates (18) who has spent the second half of the season on loan to League 2 side East Stirlingshire, where he gained valuable 1st team experience, has penned a one year contract. Defender Elliot Ford (18) and forward Callum Robertson (18) have also signed deals that keep them at Stark’s Park next term. The lads are pictured below (in order David, Ross, Elliot & Callum), putting pen to paper under the watchful eye of coach Laurie Ellis. Rovers record their worst ever defeat going down 11-2 to Morton in the final league fixture of the campaign. John Calder equalled the Second Division league record of scoring eight goals in the one match.